The El Segundo Council meeting after the election should have been a straightforward ceremonial passing of power from the old to the new Council. However, defeated Mayor Bill Fisher made the meeting all about himself, and then his ally, Marie Fellhauer, made it all about attacking newly elected Council members, Suzanne Fuentes and Mike Dugan. Fisher used his bully pulpit for the last time. He gave a long-winded speech repeating his campaign material, taking credit for the work and accomplishments of others including Carl Jacobson and even myself. As usual, he stated numerous falsehoods and, without any proof, accused others of lying even though they backed up their statements with evidence. The election might be canceled due to a lack of candidates, as in 2006, when Fisher was appointed after potential candidates were intimidated by the unprecedented 2004 union and special interest campaign spending. It would have happened this time, if not for Dugan. Marie Fellhauer ruined the April 15 El Segundo City Council meeting, which was supposed to be a peaceful transition for the newly elected Council. She put an item on the agenda to eliminate pay and benefits for elected Council members, but interestingly, not for the elected city clerk and treasurer who are paid significantly more. Fellhauer falsely claimed the Council cannot cut union salaries and compensation and, therefore, Council member pay and benefits should be eliminated. Obviously, her real agenda is to punish newly elected Council members who support union compensation and pension reforms necessary to keep our city solvent and viable. Fellhauer is angry and vindictive because she lost her Council majority when Fisher lost the election. Fellhauer demanded Suzanne Fuentes and Mike Dugan give up their $900 per month City Council pay and benefits if she gives up hers. She neglected to mention she is a highly paid police union member in Los Angeles with a lavish pension and benefits, and a cushy desk job, all at taxpayer expense. El Segundo City Council pay is low. We are fortunate to have Suzanne Fuentes and Mike Dugan on Council. Both are experienced managers from major corporations. It is the overpaid police and fire unions that are causing serious financial problems, not City Council pay. Fellhauer wants to punish honest, independent, more qualified Council members. Clearly, the police and fire union members who don’t even live in town have a representative in Marie Fellhauer, but the residents and taxpayers do not. Marie Fellhauer ruined the April 15 City Council meeting, which was supposed to be a peaceful transition for the newly elected Council. She put an item on the agenda to eliminate pay and benefits for elected Council Members, but interestingly, not for the elected City Clerk and Treasurer who are paid significantly more. Fellhauer falsely claimed the Council cannot cut union salaries and compensation, and therefore Council Member pay and benefits should be eliminated. Obviously, her real agenda is to punish the newly elected Council Members who support union compensation and pension reforms necessary to keep our city solvent and viable. Fellhauer is angry and vindictive because she lost her Council majority when Fisher lost the election. Fellhauer demanded Suzanne Fuentes and Mike Dugan give up their $900 per month City Council pay and benefits if she gives up hers. She neglected to mention she is a highly paid Police Union member in Los Angeles with lavish pension and benefits, and a cushy desk job, all at taxpayer expense. El Segundo City Council pay is low. We are fortunate to have Suzanne Fuentes and Mike Dugan on Council. Both are experienced managers from major corporations. It is Police and Fire Unions being overpaid that are causing serious financial problems. Fellhauer wants to punish honest, independent, more qualified Council Members. Clearly, the Police and Fire Union members have a representative in Marie Fellhauer, but the residents and taxpayers do not. First council meeting after an election “traditionally” has consisted of well wishes and thanking the people for their vote, turned into 30 minutes of half-truths, lies, condescending remarks and placing blame on others that did not vote their way. We have lost our “Mayberry” traditions by self-serving politicians who prefer a “Santa Monica” version of El Segundo. Ex-mayor Fisher “claims” he had to “jump in” before “the economic time frame door closed”. No time for “traditional” change of Council leadership. It’s my opinion, in 2012, when Mayor Busch decided not to run, Bill Fisher assumed he was the “heir” to the Mayoral throne. But he wasn’t elected Mayor or re-elected Mayor Pro-tem. He became just an ordinary councilman. Thus started the “plot” to obtain his desired title, which he executed 5/21/13. As for his frequent misstatement of facts, let’s just take Fisher’s repeated claim that the firefighters union took a 9% cut in salary and a 17.5% cut in compensation in 2010. He repeated this claim in council meetings on 3/4/14, 3/18/14, 4/1/14 and 4/15/14. Fisher has never shown any documentation to verify these claims. He’s just talk. For years Fisher has refused to examine my documents to disprove me. On 4/15/14 during Public Communications, I again produced these documents. Neither Fisher nor his loyal supporters Fellhauer and Atkinson asked to see these documents during or after any of these meetings. Apparently they think repeating falsehoods often makes them true. Thank you to the 57 percent of voters who voted No on Measure A and to those who voted for Suzanne Fuentes and Mike Dugan. That puts our city on a better footing for negotiating with the city unions and instituting necessary compensation and pension reforms to ensure the viability of El Segundo as a city. According to FPPC filings, four city employee unions contributed a total of $17,500 to the Yes on A campaign to raise our taxes and their pay: the El Segundo Firefighters PAC donated $5,000 on Feb. 11; the El Segundo Police Officers Association PAC donated $5,000 on Feb. 25; the El Segundo City Employees Association donated $5,000 on Feb. 28; and the California Teamsters Public Affairs Council donated $2,500 on March 11. There’s an inherent conflict of interest when government employee unions campaign for candidates and ballot measures that will increase their salaries and pensions – and raise our taxes to pay for it. We don’t want people who live outside our city running the city for their own economic benefit. The biggest spenders were the biggest losers. The Yes on A campaign spent $33,130 for 1,402 votes (43 percent) at a cost of $23.63 per vote. The grassroots No on A campaign received 1,841 votes (57 percent). Bill Fisher spent $19,671 for 1,545 votes (28 percent) at a cost of $12.73 per vote. One winner, Suzanne Fuentes, spent $7,927 for 2,047 votes (38 percent) at a cost of $3.87 per vote. And the other winner, Mike Dugan, spent $2,833 for 1,859 votes (34 percent) at a cost of $1.52 per vote. Three flyers containing verifiable factual information about Measure A were distributed to residents and small businesses on the weekend of April 5, 2014. Click on each of the links below to view, download, and print them. Please share them with your friends and neighbors in case they did not get all of them. Below is the content of Flyer #3, with added photos, links, and information documenting the facts contained in the flyer. The “Yes on A” campaign has lost the debate. Their arguments have been refuted, and many have been shown to be outright deceptive and dishonest. So they switched to using the campaign slogan, Measure A is “supported by people you know and trust”. But if you really knew most of them, you probably would not trust them. “Measure A – Supported by People You Know and Trust” slogan on a “Yes on Measure A” campaign mailer delivered on 3/29/2014. See PublicSafetyProject.org for more information, details, and proof. Sandra Jacobs, one of two “Yes on A” campaign co-chairs, was one of a slate of three Fire and Police Union sponsored City Council candidates. See the details on the below, including the $46,204 in campaign money. Joe Harding, one of two “Yes on A” campaign co-chairs, was AGAINST the tax hikes when he was a Hacienda Hotel employee. NOW, this ex-employee is FOR the tax hikes that will be devastating to his former employer. Click HERE to see the video of Joe Harding making this speech at the 8/3/10 El Segundo City Council meeting, and to read a transcript of his speech. Do you trust all the City employee union members who donated $17,500 (thus far) through their unions – to get a whopping $6.6 Million per year in return to pay for their past and future excessive pay raises and resulting pension increases? Let’s go down the memory hole and recover Bill Fisher’s forgotten history. Fisher’s political career was launched by the Fire and Police Unions when they ran a three-candidate slate including Fisher and Sandra Jacobs (“Yes on A” campaign co-chair). Fisher claims he knew nothing about the union support. However, Fire Union president Kevin Rehm’s cell phone number was on the campaign signs for each of the slate candidates as the contact number for campaign sign management. I called that number during the election campaign and Kevin Rehm answered. I spoke with him and asked him questions about the firefighter union’s candidate endorsements. You can do an Internet search for the following keywords to see that this is Kevin Rehm’s phone number: (310) 422-9411 Kevin Rehm. See the photos of the three candidate’s campaign signs with firefighters union president Kevin Rehm’s cellular phone number on them below. The first two photos show the entire signs at a distance to make it clear the close-up photos of the sticker on the corner each sign are of the same campaign signs. 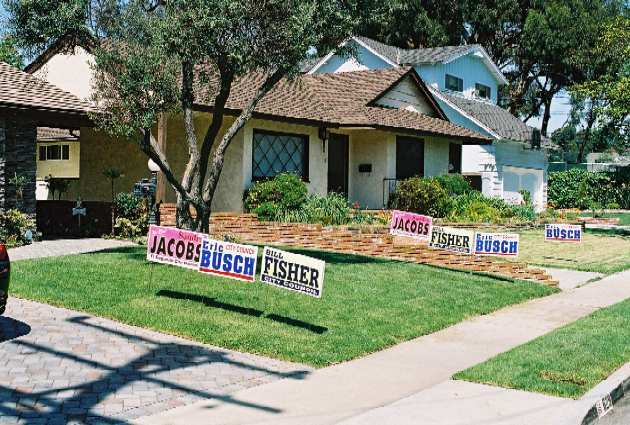 The El Segundo firefighters union installed triple the campaign signs for City Council candidates Sandra Jacobs, Bill Fisher, and Eric Busch at a house on the east side of town. 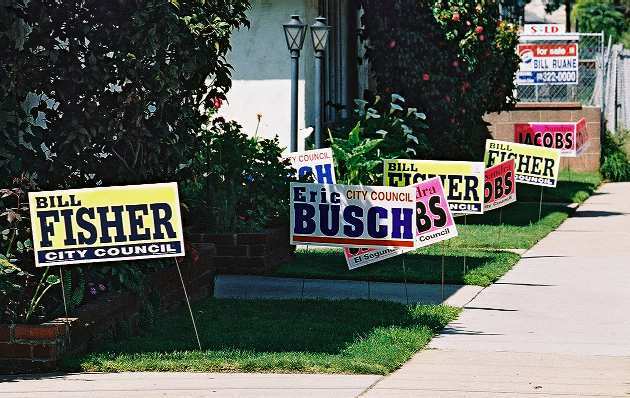 The El Segundo firefighters union installed double the campaign yard signs for City Council candidates Sandra Jacobs, Bill Fisher, and Eric Busch at a house on the east side of town. See the photos below of the campaign signs with firefighter union president Kevin Rehm’s cellular phone number (310-422-9411) on them as the sign placement and maintenance coordinator. His phone number sticker was on all the campaign signs for Bill Fisher, Sandra Jacobs (one of the two Measure A co-chairs), and Eric Busch. Bill Fisher’s City Council campaign sign with El Segundo firefighter union president Kevin Rehm’s cellular phone number on it. Sandra Jacobs’ City Council campaign sign with El Segundo firefighter union president Kevin Rehm’s cellular phone number on it. Eric Busch’s City Council campaign sign with El Segundo firefighter union president Kevin Rehm’s cellular phone number on it. The unions sent out slate campaign mailers featuring studio portrait photos of all three candidates, with color-coordinated backgrounds. See the scanned images below of the campaign slate mailer postcard sent to El Segundo voters by the two unions. The firefighters and police unions claimed that they endorsed “The Best Choice For Public Safety”. That was a lie. They endorsed the candidates who would give them the biggest pay raises and pension increases, and then raise taxes and fees on the residents and businesses to pay for it all. Click on each picture for a larger view (will open in a new browser window or tab). When then Councilman Bill Fisher was confronted at a City Council meeting about the conflict of interest created from his firefighter and police union campaign support, given that he votes on their pay raises and benefits increases, he claimed he did not know the unions were supporting his campaign! Notice how the firefighter and police union campaign slate mailer has professional studio photos with color-coordinated matching backgrounds of Bill Fisher and the other two union-endorsed candidates. Clearly, Fisher posed for his professional photo and a copy of it was sent to the unions for use in their campaign mailer. Also, Fisher wants us to believe he did not know who was distributing, installing, and maintaining his campaign signs around the city throughout the his campaign. Rehm sent a deceitful campaign mailer on official Fire Union letterhead, threatening seniors with “the possibility of our paramedics not being available when you need them” if the three union-approved candidates were not elected! The El Segundo firefighters union even sent out a campaign letter on their official union letterhead, signed by union President Kevin Rehm, 1st Vice President Breck Slover, and 2nd Vice President John Bilbee, threatening senior citizen voters with “the possibility of our paramedics not being available when you need them” if the three candidates approved by the union were not elected! See the scanned image of this letter and the envelope it was sent in below. Click on the letter below to see a larger image of it (will open in a new browser window or tab). Click HERE for an analysis and the text of the Senior Scare Letter on our old web site. Then click the BACK button in your browser to return to this web page. The mysterious “Committee To Continue The Progress Of El Segundo” spent $46,204 including union and out-of-town donations campaigning for the slate. Fisher narrowly lost that election, but was APPOINTED to the Council two years later. That election was CANCELLED due to lack of candidates. The unprecedented campaign spending intimidated potential challengers. Fisher rewarded the unions well with 11.25% to 23% in pay raises during the Great Recession, including retroactive pay raises effective nine months before the date of approval, plus additional 5% annual “step-raises”, jacking up compensation and pensions. Fisher also supported single pay raises of 14.9% to 32.3% for the non-union managers (Deputy Fire Chief, Fire Battalion Chiefs, Police Chief, and the Fire Chief) to avoid “salary compaction”. The pay raises were approved in secret in one or more closed session City Council meetings, and were made public and given a public vote of approval as a mere formality in the April 7, 2009 and December 2, 2008 open session City Council meetings, after they were already a done deal. Rehm’s pension pays him $172,516 per year. Measure A will only pay for more union rewards! Fisher hoped to get appointed to City Council again without an election, but a third candidate emerged the last day of the filing period. Please Vote NO on Measure A and AGAINST Bill Fisher on April 8th. For voting information, see ElSegundo.org or contact the City Clerk. This flyer is a response to late campaign mailers and late campaign contribution reports. Check the PublicSafetyProject.org web site for documentation, proof, and responses to any last-minute hit pieces. Posted in California, El Segundo, El Segundo Election Coverage, El Segundo News, El Segundo Tax and Fee Increases, Elections, Firefighter and Police Union Compensation and Pensions, Firefighter Union Corruption, Government Employee Compensation and Pensions, Measure A - 5 New Taxes and 6 Tax Inceases, Police Union Corruption, Political Corruption, Politics, Union Corruption, Videos	| Tagged 2014 El Segundo Flyer #3, April 8 2014 El Segundo General Municipal Election, Bill Fisher, campaign, city, El Segundo, El Segundo 2014 Measure A Tax Hikes, El Segundo Firefighters Association, El Segundo Flyer #3, El Segundo Police Officers Association, election, ESFA, ESPOA, fire union, firefighter union, Flyer #3, Measure A, Michael D. Robbins, Mike Robbins, police union, safety unions, unions	| Comments Off on El Segundo Flyer #3 – Vote “NO” on Measure A, and Against BILL FISHER! Below is the content of Flyer #1, with some increased detail, and some added links documenting the facts contained in the flyer. Eleven Tax Hikes in One Measure! To Raise OUR TAXES and THEIR PAY! All but one firefighter and most police and other city employees don’t even live in town! YOU MUST VOTE April 8 to STOP IT. All of this information comes from official City of El Segundo public record documents. For more info and proof, see PublicSafetyProject.org. Last year City Council raised Chevron’s taxes by more than $8.5 Million average per year for 15 years, but the City Council keeps coming back for more taxes! Check the PublicSafetyProject.org web site for documentation and responses to any last-minute hit pieces. Posted in California, El Segundo, El Segundo Election Coverage, El Segundo News, El Segundo Tax and Fee Increases, Elections, Firefighter Union Corruption, Measure A - 5 New Taxes and 6 Tax Inceases, Police Union Corruption, Political Corruption, Politics, Union Corruption	| Comments Off on El Segundo Flyer #1: Vote “NO” on Measure A – Eleven Tax Hikes in One Measure! Three flyers were distributed over the weekend to residents and small businesses in El Segundo. Here are some links to web pages containing information, photos, and links to files, as support and proof for statements made in flyers distributed the weekend of April 5, 2014. View or download a PDF file containing the El Segundo City Employees Total Compensation + CalPERS Pension Contributions paid by the City, sorted in descending order. View or download a PDF file containing the CalPERS pension plan contributions as percentages of regular earnings and special compensation that the City of El Segundo and its employees pay towards the Employer Contribution and the Employee Contribution. This data was obtained using a California Public Records Act Request. The “City of El Segundo Can Save $3.3 Million Per Year in Employee Pension Costs” web page has documentation on the 11.25% to 32.3% fire and police raises over three years during the Great Recession, and on how the City can save $3.3 Million yearly by requiring City employees to pay half the total CalPERS pension contributions. The “El Segundo Measure A Co-Chair Joe Harding was Against the Tax Hikes Before He was For Them” web page has a video and transcript of the speech Joe Harding gave at the El Segundo City Council meeting AGAINST increasing the Utility Users Tax (UUT) and Hotel Transient Occupancy Tax (TOT). The “Have the Measure A Supporters Earned Our Trust?” web page has further links to downloadable scanned public record documents in PDF files. The “El Segundo Firefighters Union is Bankrolling the Measure A Campaign to Hike Taxes” web page has information, photos, and links to web pages with scanned documents. SCROLL DOWN TO SEE FIRE AND POLICE UNION SLATE CAMPAIGN MAILER SCANS AND CAMPAIGN YARD SIGN PHOTOS. “You must say ‘No’ to the hotel killer tax. … A TOT, and a UUT would hit us twice. That’d be like kicking us when we’re down, and then running us over for good measure. … The City must make unpopular and difficult adjustments to their payroll and expenses. Asking businesses to pick up the bill for the City and its residents in this economy is simply is not a fair approach. The Hacienda has been and will remain a stellar business in this community. Help make sure this continues. Leave the TOT where it is. It’s working for us. It’s working for the City. … Thank you.” – Joe Harding, General Manager of the Hacienda Hotel in El Segundo, speaking at the August 3, 2010 El Segundo City Council meeting, before he became an ex-employee of the Hacienda, flip-flopped, and became a co-chair of the Yes on Measure A committee to raise both the TOT and UUT taxes on the Hacienda and all other hotels and businesses in El Segundo, and to impose them on residents. Sandra Jacobs last ran for City Council together with current Mayor Bill Fisher and former Mayor Eric Busch when they first ran for City Council. They were the three-candidate slate that the El Segundo firefighter and police unions endorsed, funded, and actively campaigned for. Mayor Bill Fisher and former Mayor Eric Busch started their political careers in El Segundo with tremendous campaign support from the El Segundo firefighter and police unions, and rewarded them well with millions of taxpayer dollars. Click on each picture for a larger view (will display in a new window or tab). Either Bill Fisher is lying, or he is too incompetent to hold any elective office. In either case, is not fit to hold a position of public trust and to be entrusted with spending more than fifty million of our tax dollars every year. See the photos below of the campaign signs with firefighter union president Kevin Rehm’s cellular phone number (310-422-9411) on them as the sign placement and maintenance coordinator. His phone number sticker was on all the signs for Bill Fisher, Sandra Jacobs, and Eric Busch. Click on the letter below to see a larger image of it (will display in a new window or tab).